Thank you for sending in your vintage men’s Rolex wristwatch to mearto for a fair market appraisal. I will try to assist you with that today. Case– 36mm diameter, three leaf, polished and brushed stainless steel and gold, screw-down case back with knurled edge and original green Cornet paper and screw-down gold crown, bidirectional revolving reeded gold bezel embossed with Arabic numerals in relief for 60-minute graduation, crystal with cyclops lens. The watch is integrated with a steel and yellow gold Rolex Jubilee bracelet. . . Dial - Champagne dial with applied yellow gold baton hour indices each with luminous dot, bar outer minute/seconds divisions divided into half seconds, aperture for the date @3. Luminous yellow gold baton hands and counterbalanced center seconds pointer. Dial is marked” Rolex, Oyster Perpetual, Datejust, Superlative Chronometer, Officially Certified” and T-Swiss-T at the dial base. . .
Movement – NOT SHOWN but likely the Rolex Cal. 1570, a rhodium-plated, stippled perlage decorated plates, 26 jewels, straight-line lever escapement, monometallic balance adjusted to 5 positions and temperature, shock absorber, self-compensating free-sprung Breguet balance spring, Microstella regulating screws with the dial, case and movement triple signed. . . Condition: The overall condition appears to be very good to excellent. Mild oxidation to the gilt bezel with fine slightly darkened patina. The original paperwork, tags, warrantee and box are not present. The dial is excellent. There are scattered tiny areas of scratches or scuffs on the bracelet and the lugs, but for a watch from the 1960s this is splitting hairs. The watch retains a great traditional Rolex look. 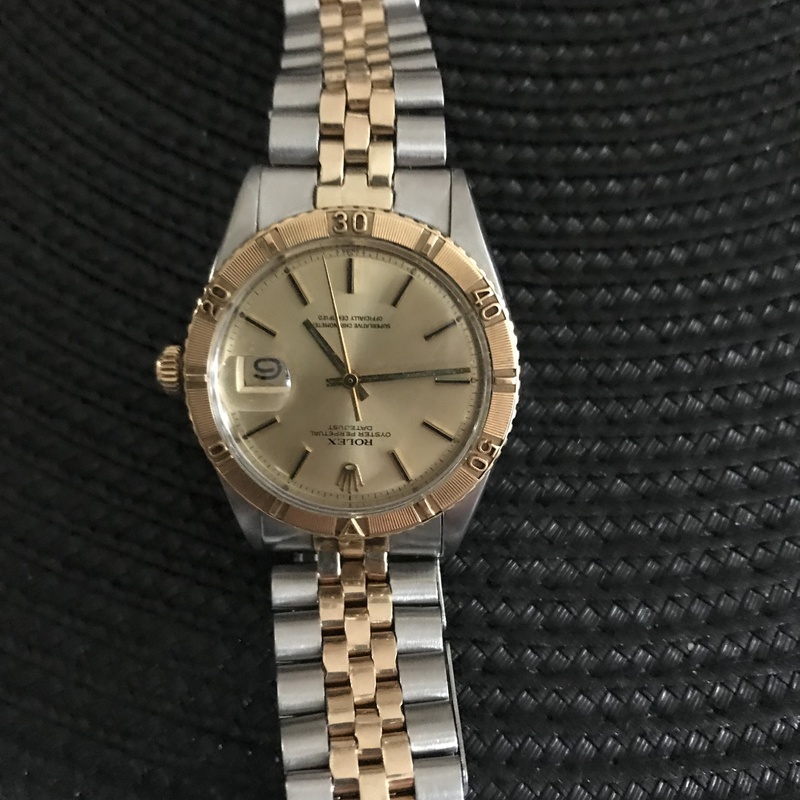 I have compared this vintage Rolex with other similar examples at auction sales to provide you with a range of fair market value. Retail prices will vary and tend to be significantly higher. I hope I have been of some assistance to you today.